Marco was born on the 10th of October 1973 in Gelsenkirchen Germany. His foray into music was at the age of 7 when his parents bought him a Bontempi Organ. But his real fascination into music occurred in 1986 when on a music program he saw Koto perform "Jabdah". This track had such a profound effect on him that he had to have more of this music. He was fascinated with artists such as Laserdance, Hipnosis and Cyber People, later on he discovered other synthesizer artists such as Jean Michel Jarre, Jan Hammer and Tangerine Dream. Marco started creating his own studio tracks; he began to compose as well as record demo tracks on his 4 x 6 recorder. Marco released his 1st CD in collaboration with his friend and DJ under the name Q-Base back in 1997, the album's name was "Everlasting". In 2001 Marco got in touch with a Swedish artist by the name of Anders Lundqvist. Together they formed Macrocosm and in the following year produced their collaborative effort titled "First Mission" which was released by Hypersound Records. The next Macrocosm album titled "Second Voyage" was released in 2005. 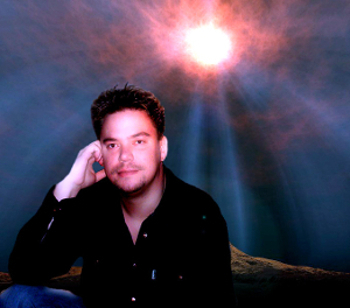 In addition to his Macrocosm work, Marco has also produced many tracks for Hypersound featured on the Synthesizer Dance Series. From the year 2008 Marco has started to work with SPACESOUND RECORDS. Hello and welcome to Space Sound Records. We would like to shed some light on the individuals who make the music we all love. What better way than hearing it from the artists themselves. 1. Can you tell us a little about yourself and what do you do? I work in administration in an office. Music is my big hobby so whatever is left of my spare time I watch films. I have to admit that I am a big fan of Science fiction films. Also I am a traveller. In addition I enjoy playing billiards however there never seems to be much time for that. 2. How did you get involved in music and do you have a music background? As I have previously stated music is a hobby for me. In my youth I took keyboard lessons, however the most I learnt was from myself. Making music was also a big satisfaction. What fascinated me the most was making something out of nothing. The end product is mostly happy but sometimes not. This effect is an integral part of composing music in many ways a declaration to oneself. 3. Besides spacesynth what other hobbies do you have? I like many categories of music. The most important thing for me is a good melody. It also depends early on what sort of mood I’m in. My favourite as well what steered me in music or better said what got me into music was artists like Jean Michel Jarre, Vangelis, Jan Hammer, Michael van der Kuy, Rob van Eijk, Koto and the whole Italo Disco scene. Presently I really like the music of Schiller. 4. What other music interests you? 5. Do you compose any other music besides spacesynth, if yes, what might that be? I also compose more peaceful music ala Jan Hammer. Sometimes I do something in the genre of Dance / Trance. At the moment I am busy with remixes for the forth-coming album “Tribute to Depeche Mode” which I have great satisfaction because this music has got a lot of spacesynth elements as well as much from 80-90’s pop. 6. How did you find spacesynth or when did you first come in contact with this genre of music? That was Koto’s legendary appearance on the German Music show Formel Eins. You could say that’s when it all started. 7. What draws you to spacesynth and why do you like this music. It’s hard to describe with words, it’s a feeling that comes to me when I listen to this music. The vocal track in Spacesynth created by synthesizer sounds which then create the whole song I find very fascinating. This is not only with Spacesynth but also with other genres of instrumental music. 8. Is there anything that you dislike about this genre? In this genre of music there is nothing that I dislike. My view of this music is that it is very interesting at present. When I wasn’t producing this music in the late 80’s everything was seemed a secret to me, how was this music produced? Nowadays one can produce this music on the home computer with the applicable programs. I think that the artists in the 80’s had a much tougher time to make sure everything fitted exactly as it was supposed to. 9. Are there any group or artist(s) that have influenced you? Ha ha ha, great question, let me think. I have quite a few, my absolute favourites are Favours, Power Run, Humanoid Invasion, Jabdah and The Challenge. Listening to these tracks gave me goose bumps. There are many more such tracks but I think I would run out of space listing them. 10. Would you be interested in working in a duet or with other artists if yes who would that be? As you know I have produced 2 albums with Anders Lundqvist from Sweden. For a long time I haven’t had any contact with him. We will see what happens in the future. 11. Do you like Italo Disco? 12. A few Spacesynth artists have come from the Demo scene, were you ever part of that, if yes what was your artistic name and do you think there is any advantage to Demo artists? I never was part of the Demo Scene. I have never worked with Tracker programs, the reason for this is that until a few years ago I never knew anything about this scene. 13. Lets move to composing. How do you start with a new track? Do you, start by trying to compose a new melody or do you play around with chords and then try and fit a melody into that or is there perhaps another way? Firstly I start with the pad/string sound and the solo lead sound and try and create a melody. It is during this initial process that I know whether something will happen with the composition. As has occurred on a few occasions, I noticed after a couple of days that a melody that I have been working has no sense and I therefore have scraped everything. What frustrates me is the fact that sometimes I can invest a lot of time to no avail. 14. Recently there has been some debate about the importance of melody in spacesynth. Do you have any opinion or thoughts on this? In my eyes the melody is the heart of the composition, it is here that we find the value of the song as a whole. I believe that in Spacesynth a good melody is the most important aspect, otherwise the piece can be some what boring. Off-course it all comes down ones own taste and not everyone likes the same. 15. Spacesynth currently has many different styles for example Protonic Storm is very futuristic and pushing boundaries on the other hand Marco Rochowski epitomizes the Golden era with his classical interpretation. Where do you think you fit? Did you have to use me as an example for this question? Naturally most of my spacesynth is arranged in the typical atmosphere of Laserdance and Koto. My greatest influence has been my love for 80’s music which I like the most; basically a typical composition with a new melody. 16. This question is a sort of follow on. Where do you think the genre is heading? Some people have said that we should move on from the LD influence and embrace influences from other genres i.e. different drums, bass and not have to rely on melody. Others have argued that the melody is the essence of spacesynth and overhauling it would kill the uniqueness of the style and thus create just another electronic sub genre. Any thoughts? I think in composing music everything is allowed if one knows what he is intending. Spacesynth has a particular characteristic which thankfully keeps the music alive. Personally I believe that this music is one dimensional but that doesn’t mean that we have to use classic sounds like those from the Linn Drum or the legendary Juno Bass. The most important thing is for it to sound right and to find its place in the listeners’ ears. 17. Any thoughts on how we could improve the genre (musically and gaining more mass appeal)? It’s very important for this music to find mass appeal. I believe that this has happened thankfully through radio announcements and internet radio. In this regard I give much respect to people who have contributed to this. I don’t think there is much to do in this area to better the mass appeal. You either like this music or you don’t. In my opinion you can’t go and reverse what has happened, there have been great changes in the music market / scene and Spacesynth will never be as popular as it was. I will allow myself to be contradicted on this point. 18. What sort of gear do you use? Most recently I have been using software (Prophet, Albino, Superwave vst'is apart from this I have a lot of hardware ware synths samples taken from a good working Juno 106 and Roland D550. For production I use the Athlon 3000+PC and for the final product and mastering I use a Pentium 4 1.5 GHZ. Hardware synths Roland Juno 106,Roland XP 30,Roland D550,Korg M1,Korg X3,Ensoniq EPS 16+,Yamaha S30(with analog expansion board),Yamaha CS1x,Yamaha V50,Casio CZ101,Roland Groovebox and many VSTis’. I also have three arrangements for effects, 2 Yamahas and one Zoom, though I don’t use this any more. 19. At times debate has centered on Software synths vs. hardware, do you have a preference if yes why? 20. What’s your favourite TV show? I don’t have much time to watch television, but apart from Science Fiction and TV series I also watch documentaries on the History Channel. I also watch popular scientific shows. 21. Anything you would like to say to the fans of the Spacesynth Genre? A big thanks to all the fans, thanks to you guys our music lives and who have stayed with us. Also thanks for giving us musicians such support. 1. Tea or Coffee? Tea. 2. Market or Shopping Mall? Market. 3. Demo or Italo? Italo. 4. TV or Sport? TV. 5. Books or Cinema? Cinema. 6. Resort or Camping? Resort. 7. Summer or Winter? Summer. 8. Cat or Dog? Cat. 9. Beer, wine or Spirits? Beer. 10. Blonde or Brunette ? Brunette. 11. Sweet or savoury? Savoury. Once again thank you for allowing us your time in answering these questions, it is very much appreciated! We hope this gives the spacesynth community a little better insight into you as an artist. Thank you for doing this interview I had great satisfaction in doing it. Interview Conducted By Peter D.